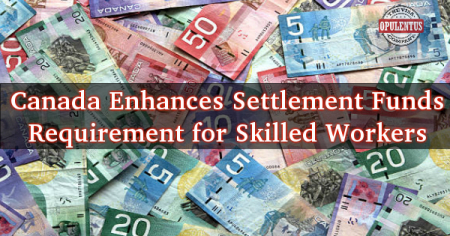 The Settlement funds required for the immigrant category of New Skilled Workers Migrating Canada has been increased for the present year. Applicants are required to show that they have enough money to support themselves and the members of their family after they reach Canada. This does not apply when the applicant is presently authorized to work in the country and, possesses a valid job offer from a Canada based employer. An important point to note is that the Applicants cannot borrow this money from any another person. They must use this money to cover the living costs for their family. This norm applies even when the family does not accompany the applicant to Canada. The amount required by the applicants to support their families depends upon the size of their families. There is an annual revision of this amount by authorities. All Applicants should know the costs of living in the place of their choice when they settle in Canada. The applicants must bring as much money as possible to lead an easy life in moving and finding a home in the country. The applicants must declare to the authorities if they bring more than $10,000 Canadian dollars in Canada. This is based on the regulations of Canadian customs. In case Non-information by the applicants the authorities can find them or imprison them.